When working with Color Management, there are a number of colorspace defaults that can be set within the Mari project. These defaults are determined by OCIO (OpenColorIO) config file roles. This article explains why we have introduced new Mari-specific OCIO roles and how using these roles can benefit your colorspace pipeline. Throughout their pipeline, VFX houses are likely to work with Color Management across various software in order to reach the final image result. Unfortunately, most applications interpret the given OCIO roles in different ways which often means that studios are forced to modify configurations within the pipeline process, or need to maintain individual configs for each application. This can be time consuming and may be troublesome for TDs who may be unsure of how role assignments affect each application. These new roles greatly streamline the colorspace pipeline. Previously, setting these options had to be done via Python in Mari. 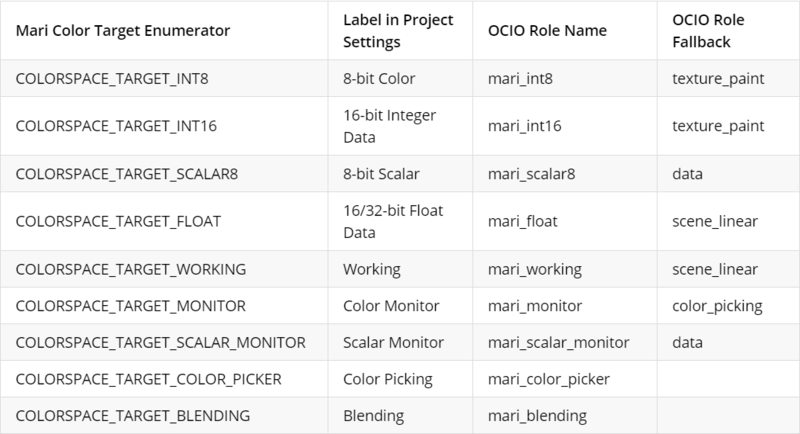 Now, the ability to define the Mari specific roles within the OCIO config file means that users are able to manage one global configuration instead of one per digital content creator. By introducing these Mari specific roles, there is no chance of conflict between applications where the same OCIO defaults may have previously been assigned to different roles; and creating inconsistencies in production are avoided. For more information on the new roles please see the Color Management section from our Mari Online Help documentation.